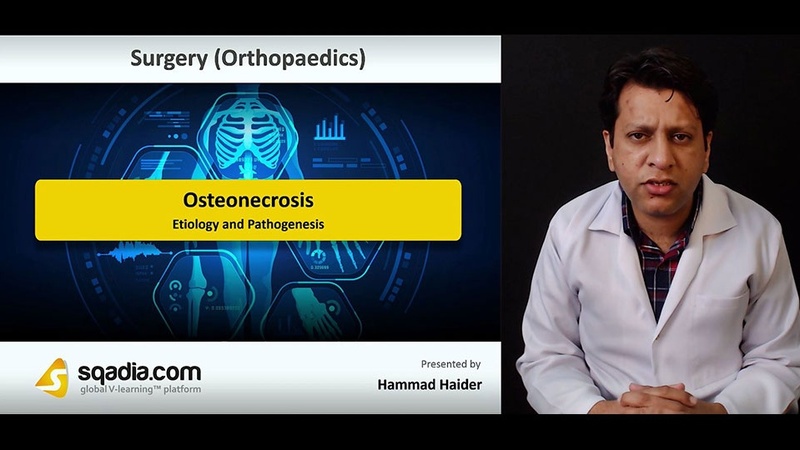 This lecture delivers extensive information about the topic Osteonecrosis. Section one is about General Aspects of osteonecrosis. In the beginning, the educator talks about the sites susceptible to ischemic necrosis and demonstrates osteonecrosis at different sites. He further discusses the initiation of avascular necrosis (AVN) and elaborates the process of osteonecrosis in detail. The incidence and demographics of the disease were then mentioned. In the end, the risk factors of hip joint were elucidated. Section two is dedicated to the discussion of Etiology and Pathogenesis. Traumatic osteonecrosis is focused in the start of this section. The educator then reports the etiology of non-traumatic osteonecrosis. After that, traumatic avascular necrosis becomes the subject of discussion, which is further demonstrated in femur and scaphoid. Non-traumatic osteonecrosis and its pathological sequence then comes into consideration. Moving forward towards the end, the educator draws a comparison between a normal head and an osteonecrotic head. Section three is about the Clinical manifestations of the disease. Initially, the symptoms of osteonecrosis are mentioned. The examination of an osteonecrotic patient is then demonstrated. The educator also comments on the advanced hip osteonecrosis and X Ray of AVN hip which shows a crescent sign. Subsequently, the investigations and imaging techniques and radiographic investigations are pursued. This disease is further explored in detail by demonstrating the MRI images showing osteonecrosis, hip AVN and AVN of head of femur. Lastly, the investigations of this conditions were highlighted. Section four deals with the Treatment Guidelines. Firstly, the educator gives an overview regarding the staging of disease. After that, the Steinberg classification system and Arco staging are introduced. Treatment of osteonecrosis is also discussed in this section. Early, intermediate and late osteonecrosis is elucidated in the end. Section five imparts detailed information about Surgical Treatment. First of all, the core decompression with graft is explained. The educator then differentiates between the trap door technique and light bulb technique. Next comes the vascularized fibular graft, which is followed by hip resurfacing and partial replacement. In the end of this lecture, core decompression without graft is comprehensively discussed.